Yes, God will forgive you of sin when you meet certain conditions. Review this Bible study to get the details. I (God) will forgive you for the wicked things you did, and I will not remember your sins anymore. Can you believe that God will forgive you for the wrongful things you did and are doing? Fortunately, the answer is YES—God will forgive you—He is a God of forgiveness. If you have not done so, please review “God forgives you” before continuing with this powerful Bible study. One way to define the word forgive is to reduce, decrease and eventually eliminate a negative feeling towards another. The Pharisees and Jesus use the Greek word aphiemi (af-ee’-ay-mee) in various forms: forgive, ‘are forgiven‘ (Luke 5:23 KJV uses “be forgiven”), ‘to forgive‘ and ‘is forgiven‘. Take your time with this Bible study especially in getting to know the meaning and proper use of aphiemi as it is applied to forgiveness. NOTE: The examples used here do not present the conditions that accompany God’s forgiveness to mankind, so please do not stop—continue this lesson to gain a better understanding of how God will forgive you. If you have more time please continue, if you don’t have time for more, please jump to the end to give feedback in the comment area/poll. Go to end. 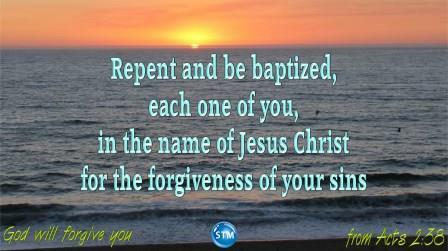 God will forgive you when you repent. “Deeds worthy of repentance” what does it mean? Take a look at this link for a few versions of Acts 26:20 that may help. I am working on a few studies to help us understand what it means to repent. 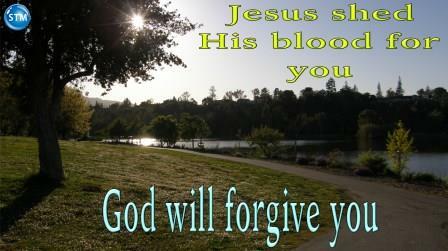 ♥ Question for ‘God will forgive you part-1’: Do you realize that Jesus died so you can receive God’s forgiveness? God wants you to hear His message. I apologize to anyone that has been hurt or offended by God’s people. We are not (should not be) judging people when we present God’s word. As a representative for Christ I ask that you consider your life as it is. Are you at least a little curious about God and what it is like to be His child? Each person that says they are a Christian at some point in their life had to realize they were not living a life that is pleasing to God. In order to receive forgiveness, all must repent—with Godly sorrow remembering that God knows our hearts (Psalms 44:21). Are you guilty of any of the above? If you want to change the way you live—if you are deeply sorry for the wrong you have done, God will forgive you just ask. the kindness of God leads you to repentance—to change your heart and life—to change the way you think and act—turn to God. 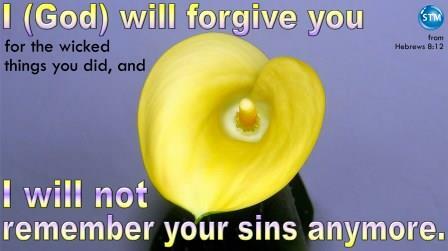 ♥ Question for ‘God will forgive you part-2’: Will you give God a chance to prove He will forgive you? Some if not many teach and believe the water baptism is a public display of your acceptance of Jesus as personal savior. 1 Corinthians 6:9-11 reminds us that we Christians were guilty of sinful acts before water baptism—”but you have been washed“; supported by Hebrews 10:22 “…our bodies washed with pure water.” and 2 Peter 2:9 (NKJV) “…cleansed from his old sins” [read 1 Corinthians 6:1-11; Hebrews 10:19-25; 2 Peter 2:4-11]. 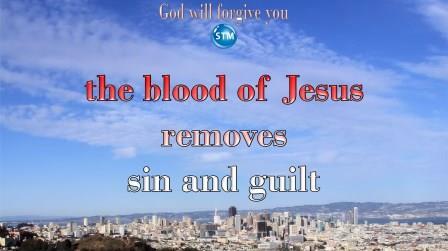 ♥ Question for ‘God will forgive you part-3’: Will you accept the sacrifice that Jesus made for you? The phrase ‘we confess’ in 1 John 1:9 is from the Greek word homologeo (hom-ol-og-eh’-o) meaning to confess, i.e. to admit or declare one’s self guilty of what one is accused of. The act of confession of sin is to freely admit or acknowledge that we have sinned, then our faithful (trustworthy), just and righteous God will forgive. 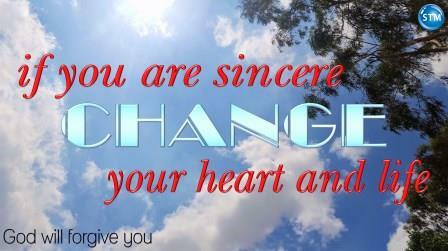 ♥ Question for ‘God will forgive you part-4’: Have you confessed your sins? 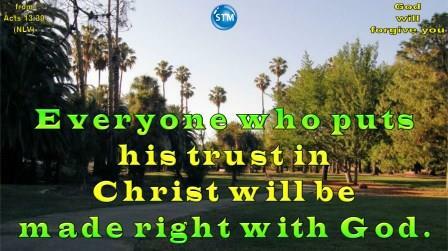 Everyone who puts his trust in Christ will be made right with God. 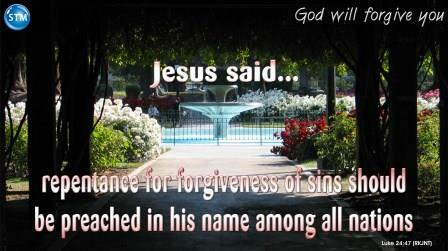 Jesus made God’s forgiveness of sins possible, if not for the death on the cross forgiveness is impossible. Christ didn’t enter the holy place made by human hands, but into heaven itself, so that he now appears in God’s presence for us. Christ did not have to offer himself many times. He wasn’t like a high priest who goes into the most holy place each year to offer the blood of an animal. But He made one eternal sacrifice; the shedding of His blood to satisfy the need of a blood sacrifice to bring forgiveness of sin. ♥ Question for ‘God will forgive you part-5’: Wouldn’t you like to be right with God? When you work, you earn the payment that you get. We cannot do any type of work to earn the grace-gift of God’s favor or forgiveness. It is by faith, in the sacrifice of Jesus that we become right with God (justified), i.e., our sins are forgiven because Jesus paid the price to redeem us. In Romans 4:8 Paul quotes Psalms 32:1-2 and I recommend that you read Romans 4:1-5:11 and 10:3-9, Galatians 2:15-16 and Psalms 51. The day will come when God will judge every person bringing eternal punishment for the unforgiven sinner (Matthew 25:31-46; Jude 1:12-15 and 2 Peter 3:1-13) and eternal life for the righteous. A day when everyone will get what they deserve according to the way they lived this life. For those whom God judges ‘guilty’—”he who puts in the seed of the flesh will of the flesh get the reward of death“. For those whom God judges ‘not guilty’—”he who puts in the seed of the Spirit will of the Spirit get the reward of eternal life“. ♥ Question for ‘God will forgive you part-6’: “Not guilty”, is that God’s verdict for you? When is God’s ‘forgiveness of sins’ applied? When you repent or confess? By believing or having faith in God and the death of Jesus? When you are water baptized? Romans 6:3-11 All of us were baptized into Christ Jesus. Don’t you know that we were baptized into his death? 4 By being baptized, we were buried with Christ into his death. Christ has been raised from the dead by the Father’s glory. And like Christ we also can live a new life. 5 By being baptized, we have been joined with him in a death like his. So we will certainly also be joined with him in a resurrection like his. 6 We know that what we used to be was nailed to the cross with him. That happened so our bodies that were ruled by sin would lose their power. So we are no longer slaves of sin. 7 That’s because those who have died have been set free from sin. 8 We died with Christ. So we believe that we will also live with him. 9 We know that Christ was raised from the dead and will never die again. Death doesn’t control him anymore. 10 When he died, he died once and for all time. He did this to break the power of sin. Now that he lives, he lives in the power of God. Hopefully, by reviewing all of the scriptures provided in this series (parts 1-7), you already have the answer. Were you expecting the answer? Have you taken the time to read the scriptures included with each post (part 1-7)? Oh my, you did know that this was a bible study series, right? ♥ Question for ‘God will forgive you part-7’: Did you study the scriptures provided in this series? Scripture quotations marked (CEV) are from the Contemporary English Version Copyright © 1991, 1992, 1995 by American Bible Society, Used by Permission. || (ERV) Taken from the HOLY BIBLE: EASY-TO-READ VERSION © 2001 by World Bible Translation Center, Inc. and used by permission. || (ICB) Scripture taken from the International Children’s Bible®. Copyright © 1986, 1988, 1999 by Thomas Nelson. Used by permission. All rights reserved. || (NCV) Scripture taken from the New Century Version®. Copyright © 2005 by Thomas Nelson. Used by permission. All rights reserved. || (NIRV) Scriptures taken from the Holy Bible, New International Reader’s Version®, NIrV® Copyright © 1995, 1996, 1998 by Biblica, Inc.™ Used by permission of Zondervan. www.zondervan.com The “NIrV” and “New International Reader’s Version” are trademarks registered in the United States Patent and Trademark Office by Biblica, Inc.™ || (NKJV) Scripture taken from the New King James Version®. Copyright © 1982 by Thomas Nelson. Used by permission. All rights reserved. || (TLB) Scripture quotations marked (TLB) are taken from The Living Bible copyright © 1971. Used by permission of Tyndale House Publishers, Inc., Carol Stream, Illinois 60188. All rights reserved. For GOD I live and For I will Die.. Thank you for the passage in which I have read.. Be blessed Bishop as well as your Family and First Lady Ann..YOU all are forever in my heart..